The Grass Roots was originated by the writer/producer team of P.F. Sloan and Steve Barri as a pseudonym under which they would release a body of Byrds/Beau Brummels-style folk-rock. Sloan and Barri were contracted songwriters for Trousdale Music, the publishing arm of Dunhill Records, which wanted to cash in on the folk-rock boom of 1965. Dunhill asked Sloan and Barri to come up with this material, and a group alias under which they would release it. The resulting Grass Roots debut song, Where Were You When I Needed You, sung by Sloan, was sent to a Los Angeles radio station, which began playing it. The problem was, there was no Grass Roots. The next step was to recruit a band that could become The Grass Roots. Sloan found a San Francisco group called The Bedouins that seemed promising on the basis of their lead singer, Bill Fulton. Fulton recorded a new vocal over the backing tracks laid down for the P.F. Sloan version of the song. The Bedouins were, at first, content to put their future in the hands of Sloan and Barri as producers. However, the rest of the group was offended when Fulton was told to record their debut single, a cover of Bob Dylan's The Ballad Of A Thin Man, backed by studio musicians. When that single, released in October of 1965, became only a modest hit, The Bedouins - except for their drummer, Joel Larson - departed for San Francisco, to re-form as The Unquenchable Thirst. Sloan and Barri continued to record and released Where Were You When I Needed You. The album never charted. 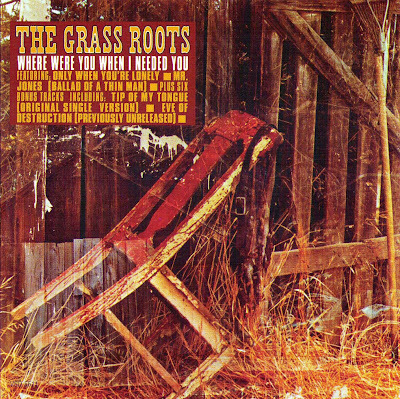 Amid the machinations behind Where Were You When I Needed You, no "real" Grass Roots band existed in 1966. A possible solution came along when a Los Angeles band called The 13th Floor submitted a demo tape to Dunhill. This group, consisting of Warren Entner, Creed Bratton, Rob Grill, and Rick Coonce, was recruited and put in the hands of Sloan and Barri. The first track cut by the new Grass Roots in the spring of 1967 was Let's Live For Today, a new version of a song that had been an Italian hit, in a lighter, more up-tempo version, for a U.K. band called The Rokes. Let's Live For Today was an achingly beautiful, dramatic, and serious single and it shot into the Top 10 upon its release in the summer of 1967. An accompanying album, Let's Live For Today, only reached number 75. The group began spreading its wings in the studio with their next album, Feelings, recorded late in 1967, which emphasised the band's material over Sloan and Barri's. This was intended as their own statement of who they were, but it lacked the commercial appeal of anything on Let's Live For Today, sold poorly, and never yielded any hit singles. Eleven months went by before the group had another chart entry, and during that period, Sloan and Barri's partnership broke up, with Sloan departing for New York and an attempt at a performing career of his own. The band even considered splitting up as all of this was happening. The Grass Roots' return to the charts (with Barri producing), however, was a triumphant one - in the late fall of 1968, Midnight Confessions reached number 5 on the charts and earned a gold record. Midnight Confessions showed the strong influence of motown and R&B. All songs written by P.F. Sloan and Steve Barri except as noted.